I want to design my research to create a deeper level of understanding of multi-level policy changes and pressures between the global and the local, especially in the frontier of local livelihoods and globalization. Growing up in a farming family of Nepal, I developed a feeling of complex relationship between people, ecosystem and their co-existence. This inspired me to expand my career in the field of forestry and natural resource management. I completed BSc Forestry from Tribhuvan University, Nepal in 1999. After few years of work experience in the field of participatory resource management, I got an opportunity to pursue MSc in Tropical Forestry from the Technical University of Dresden, Germany under the competitive DAAD fellowship program. I have a decade long experience as a policy practitioner in Nepal’s community forestry network, which encompasses natural resource governance, livelihoods, climate change, and biodiversity conservation in multi-donor funded projects. I enjoy bringing my knowledge from applied development practice to academic and policy arena in order to strengthen sustainable resource management. My current research explores how the international interest of neoliberal globalization has created new pressures and categories in the Global South and how resilience has been developed for policy reform from the local context. I want to design my research to create a deeper level of understanding of multi-level policy changes and pressures between the global and the local, especially in the frontier of local livelihoods and globalization. I believe my long-standing experience and involvement in Nepalese resource management organizations and policy networks promises particularly insightful policy engagement and access to the local debates. Rishi organised a panel at the Grabbing Green Conference in May 2013 with Manoj Misra (2012), Kasim Tirmizey (2012) and resource person Susannah McCandless and funding from the Alumni Innovation Fund. In March 2014, Rishi received the Excellent Academic Achievement Award from the Geography Department, University of Calgary, Canada. He also published a paper on his ongoing research, titled Bastakoti, R. and C. Davidsen.(2014). 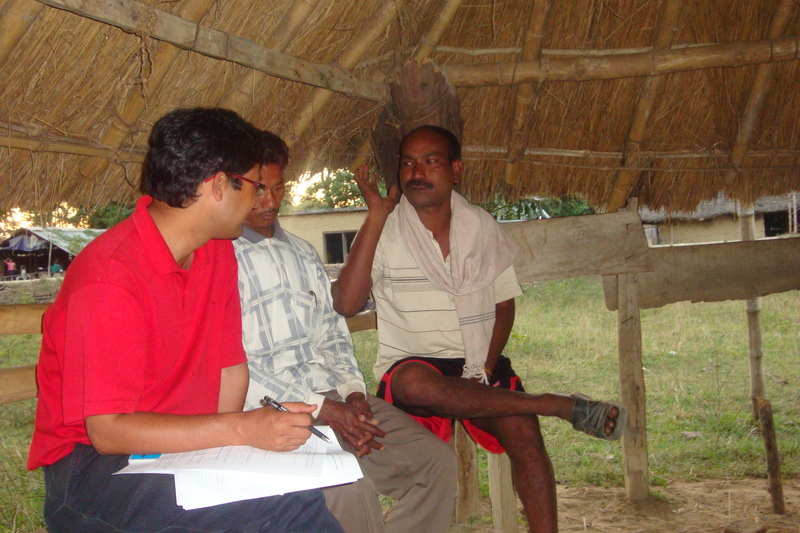 REDD+ and forest tenure security: concerns in Nepal’s community forestry. International Journal of Sustainable Development & World Ecology 21(2): 168-180. 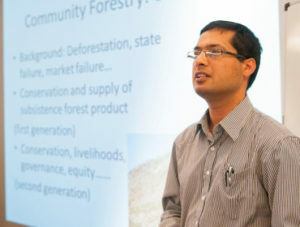 In September 2013, Rishi received the prestigious Varnier Canada Graduate Scholarship (only 167 were awarded throughout the country), providing recognition and funds for his research titled “Global Neoliberal Agendas and Local Livelihood Realities of Carbon Trade: Whose Interests, Whose Benefits in Nepal’s Community Forest Governance?”. Through this research, he aims to understand how neoliberal commodification of environmental services of forests influences the power relationships of multi-level forest governance, how global carbon emissions trading schemes are affecting local forest governance and community forestry practices in Nepal, and to provide timely policy input for the improvement of local governance in light of new market-based conservation strategies. Read this article on Rishi titled, Vaniers: Rishi Bastakoti brings his rural roots to global forestry issue.